As Henry Raeburn never left Scotland, he had little access to the general public and he didn’t have the chance to relate with his London pairs. However, for exactly the same reason, the artist kept his individuality and managed to become one of the most important artists of his country. His most famous and controversial painting is, with no doubt, The Rev. Robert Walker skating on Duddingston Loch, also called The skating minister. The authorship of this painting is still discussed as most of Raeburn’s works portrayed individuals posing ecstatic, never in motion. The story tells that the reverend grew up in the Netherlands, where he leaned to skate on ice. When he returned to Scotland, he participated in the founding of the first figure skating club of the world: the Edinburgh Skating Club. Its participants generally met on a frozen lake in the outskirts of the city, like the Duddingston Lake. 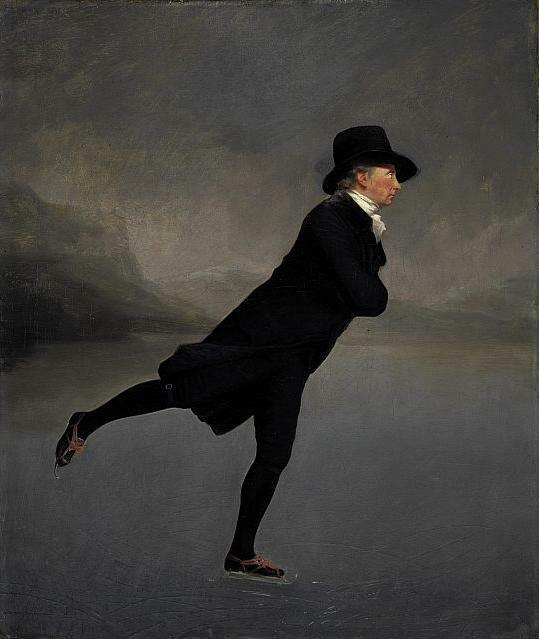 In the painting, we see the reverend sliding gracefully and effortless over the ice. Beginners in skating probably would balance their posture with their arms wide open, but this is not the case of the minister, a professional in those matters. Raeburn’s painting was almost unknown until 1949, when it was acquired by the National Gallery of Scotland; and, today, it is recognized as one of the most important works of the country. ~ by Álvaro Mazzino on March 17, 2011. Really nice to find your informative blog. We have been having a bit of fun with the Minister. It’s going to be end oof mine day, however before ending I am reading this fantastic post to increase my experience. The Boy balances out feminine outfits really well, but sometimes makes the jeans look a little too masculine for my taste. So on jeans days, I tend to grab my Classic. Republicans and Democrats, including Ryan and Barack Obama, have both called for expanding the EITC to include young people without kids–a group that’s largely excluded at the moment. This entry was posted on March 17, 2011 at 09:48 and is filed under Romanticism.You can follow any responses to this entry through the RSS 2.0 feed.You can leave a response, or trackback from your own site.